In the co-main event at Jack Hammer Promotion’sFall Brawl VIII on October 28, 2018, at Mulcahy’s Pub and Grill in Wantagh, New York, Vinny Balsamello challenges Malik Smith for the K1 Jack Hammer Promotion’s heavyweight title. This is a rematch of a fight which was declared a ‘No Contest’ due to an early knee injury acquired by planting awkwardly. Rescheduling this fight between to exciting heavyweights was the first reaction promoter Bobby Campbell mentioned after the first fight. Balsamello is a built fighter with lots of experience traveling the world competing. Vinny understands that Smith has the reach on him, but he feels his hard-hitting style and powerful leg kicks will allow him to get inside of Smith’s long arms. These two fighters are training hard for their rematch of a ‘No Contest’ bout due to a non-fight related injury. Each fighter is entering their camps in top shape which should make for an exciting match-up. This fight has Fight of the Night and Fight of the Year written all over it as the potential inside the ring will explode when their gloves touch. It’s the co-main event and will be a fight worth every penny as these heavyweights will leave no fan sitting in their seats. Tickets can be purchased by dialing 631-645-6588. This fight card will have both, amateur and professional kickboxing fights lined up. 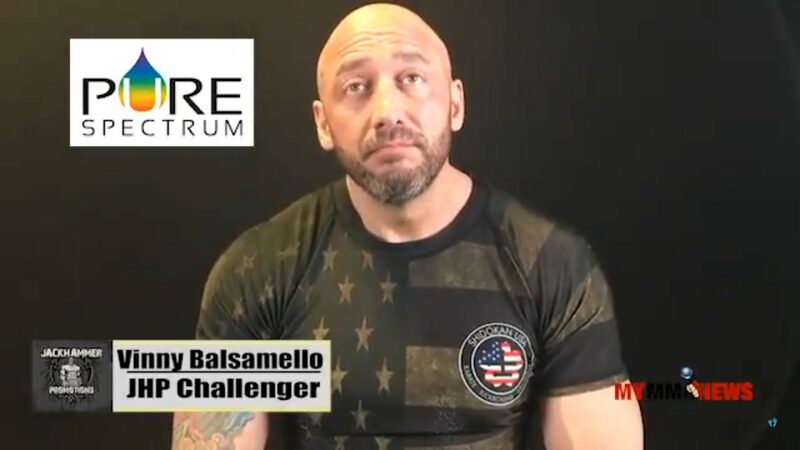 Promotor Bobby Cambell is excited for this fight card, as he believes it’s one of the best lineups he’s created in the ten-year history of Jack Hammer Promotions. This event is sanctioned by the ISKA (International Sport Kickboxing Association). Doors swing open at 4 PM est. and the first fight will kick off promptly at 5 PM. Tickets range from $50 and up. Be sure to purchase your tickets now as you don’t want to miss the long-reaching champion, Malik Smith, defend his K1 heavyweight title against the hard-hitting Vinny Balsamello in the co-main event of the evening. Be sure to follow My MMA News on social media at @MyMMANews for all of the live updates leading to and the night of the fights. This interview is sponsored by Pure Spectrum CBD. use our code ‘CCMMA‘ to get 10% off all products on the website by visiting the link below. Vinny Balsamello K1 Heavyweight Title Fight | Jack Hammer Promotion’s Fall Brawl 8. Vinny takes on Malik Smith, the champion at Fall Brawl 8 on October 28, 2018. This interview is sponsored by Pure Spectrum CBD. use our code ‘CCMMA’ to get 10% off all products on the website by visiting the link below.